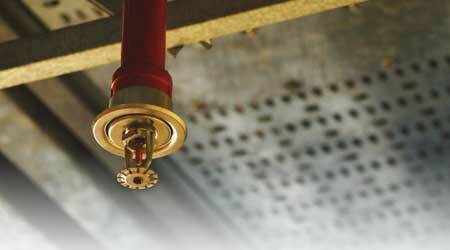 Unchecked corrosion in the fire sprinkler system can lead to loss of water pressure or burst pipes. Corrosion is a common failure mode in both wet pipe sprinkler systems and dry pipe sprinkler systems (also known as pre-action sprinkler systems), but for different reasons. Because corrosion will not occur without oxygenated water, removal of dissolved oxygen from wet pipe systems and elimination of water and/or oxygenated water in dry pipe systems are the typical goals for corrosion prevention in a building’s sprinkler pipe system. In a wet pipe system, the fire protection piping is filled with stagnant pressurized water. If an automatic sprinkler head is activated (typically by heat), then water flows immediately from the system and through any activated automatic sprinkler head. In a dry pipe system, the sprinkler piping is filled with pressurized air or another supervisory gas. If the system detects an event (independent smoke detection, flame detection, or heat detection), then a pre-action valve is opened and the system fills with water — essentially making the system a wet-pipe system. If a dry pipe automatic sprinkler head is activated by heat, then the resultant drop in gas pressure will typically open the pre-action valve and water will fill the system. Once the system is filled with water, water will flow through the activated sprinkler head. Corrosion of sprinkler pipe metals (typically black steel pipe, galvanized pipe, or ductile iron, which all have iron as their primary alloying element) only occurs in the presence of oxygenated water. 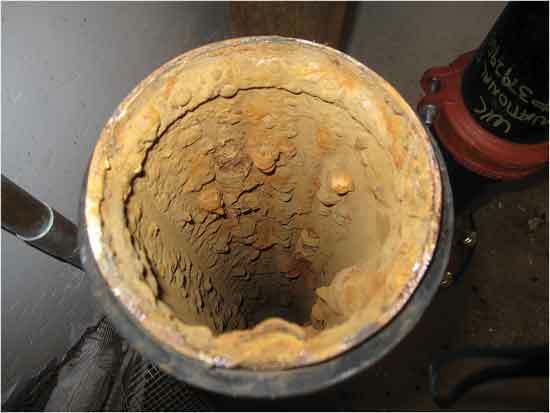 Therefore, because wet pipe and dry pipe systems have very different interior pipe environments, they are vulnerable to corrosion failures in unique ways. Corrosion is the spontaneous electrochemical oxidation, ionization, and dissolution of metals into contacting water. When metals are exposed to electrolytes — essentially water with ions in it — corrosion spontaneously occurs. A little technical background may help facility managers understand both the risk of corrosion and the options for fighting it. Corrosion is actually two synergistic electrochemical reactions — an anodic reaction and a cathodic reaction — in which electrons are transferred from one reaction site to another; i.e., there is current flow. The anodic reaction is always the ionization and dissolution of metal atoms into contacting water. There are many possible cathodic reactions. Which one occurs depends on several factors including the pH and composition of the water. Municipal water sources provide water with near-neutral or slightly basic pH, with an equilibrium concentration of dissolved oxygen of near 9 mg/L or ppm at 68 F. (The equilibrium concentration of dissolved oxygen in water is a strong function of temperature.) The typical cathodic reaction for oxygenated water with a near-neutral pH is reduction of dissolved oxygen with water to form hydroxide. For most corrosion, and corrosion of iron in particular, diffusion of oxygen to the cathodic reaction site is the controlling step that sets the overall corrosion rate. 1. An anode (where oxidation takes place, electrons are supplied, and metal atoms are ionized and dissolve). 2. A cathode (where oxygen reduction takes place, electrons are consumed, and hydroxide is evolved). 3. Electrical contact between the anode and cathode. 4. A conductive electrolyte (water) that allows charge flow and completes the circuit. All corrosion prevention technologies try to eliminate one or more of those four essential components. Note that formation of red rust (FeOOH) is not essential to corrosion. Rust is a by-product of the anodic and cathodic corrosion reactions. Depending on the water chemistry, other scales in addition to corrosion product rusts can precipitate out of the water as the water chemistry is changed by the corrosion reactions. In certain parts of the country where potable water is drawn from sources where water has percolated through deposits of limestone and chalk, “hard” water is formed that contains high concentrations of calcium and magnesium, and calcium carbonate (in particular) can precipitate out. Hard water scales can build up to the point of completely occluding a water pipe — particularly in a stagnant water-filled line such as a wet pipe fire protection sprinkler system. Depending on the hardness of the water, i.e., the scaling potential, tubercles or mounds of corrosion products can develop over the surface of localized corrosion cells — called pits. Tuberculation is a natural and normal form of corrosion in certain water chemistries. 1. Pitting that leads to through-wall perforations and leaks. 2. Build-up of corrosion products and scale, often in the form of tuberculation, that leads to a loss of system flow. 3. General wall loss due to ionization and dissolution of iron atoms from the pipe wall leads to a loss of structural integrity, and pipe breaks under the static loads of the system weight or water pressure. This type of failure often occurs at end of the life of the pipe.